My research on California echoes the national trend: more than half of the state's school districts underspend each year on their facilities, leading to all sorts of problems for students and teachers. 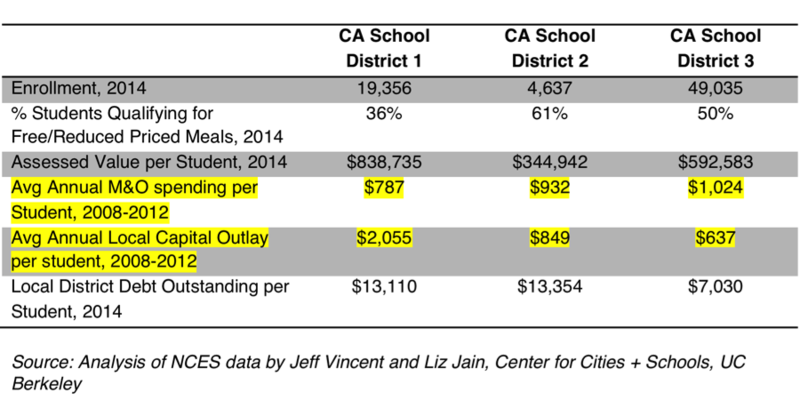 We used this same standards-based approach when looking at California districts in our recent study of school facility spending in the state, Going it Alone: Can California’s K-12 School Districts Adequately and Equitably Fund Facilities?, at UC Berkeley’s Center for Cities + Schools. The authors of the new national report point to our California analysis to further illustrate their overall national finding that we’ve got a serious structural inequity in the nation's school facility funding systems. Down south, consider San Diego Unified School District’s thorny school facilities predicament. After spending about $1 billion in facility bond funds, the districts schools are reported to be in in worse condition today than they were in 2008 – this from new data the district handed over to its Independent Citizens’ Oversight Committee. Part of the reason, as noted by a district spokesperson is that “During the course of renovating our school buildings, facilities staff, architects and engineers encountered and assessed more wear and deterioration than had originally been assessed.” And as the Voice of San Diego news outlet rightfully pointed out, “Old buildings also get older with time, and they require maintenance to ensure they don’t fall into disrepair. Buildings are aging each day, so district officials are racing against the clock to make facilities better before they get worse. Inflation can also increase costs and negatively affect the [facility condition] index.” This example shows the reality: many school buildings are in drastic disrepair from years of underinvestment and that keeping them in good repair and functional requires yearly upkeep and upgrading. The most important question needing answers is: how can we reverse this underspending and inequity? Mary Filardo, Executive Director of the 21st Century School Fund and the national report’s main author cuts to the point: "We have to be able to plan; we have to set priorities to make sure we are doing what's most important first…And what we know is that you don't get equity without planning. The people who have access and power will get things for their communities that they need, and those without access to power will not." A big obstacle to planning, though, is information about the conditions and qualities of school facilities – unfortunately too few states compile this information. But overall, there aren’t enough public funds for adequate and equitable learning environments for all children. We need to find ways of finding new public dollars. As Filardo notes, "The pie itself needs to be bigger."